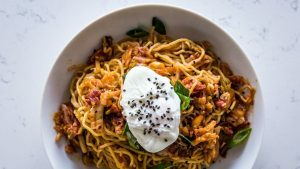 I stumbled across this looking for something else and it sounded great .. so I tried it … Its quick and flavorful for breakfast, lunch or dinner. You can also incorporate some leftover veggies, etc. I hope you like it as much as I do. 2 Tbs vinegar, white or apple cider are fine. In a large skillet over medium-high. Add diced bacon and fry till crispy. Remove and place on towel to drain. Add chopped scallion whites (save greens for later). This would also be the time to add any leftovers or embellishments you might like – mushrooms, green or pablano pepper, brocolli or even corn .. you the idea. This dish fine without them but it might make it “Mo Betta” for you. Meanwhile, boil ramen noodles 1-3 minutes until softened but still springy. Rinse in cold water to stop their cooking. Do not over cook! Add noodles to skillet with bacon, soy, sesame oil, vinegar and miring. Stir to mix and warm completely until sauce coats noodles, about 2 minutes. Season with salt if needed. Divide among bowls. Bring a medium sauce pan of water to a boil, add white vinegar and swirl poach eggs just till whites are opaque and the yolks are warmed but still creamy and hot hardened. Use a slotted spoon to pace one egg on top of each bowl of Ramen. Sprinkle some scallions, toasted sesame seeds over each. Have some Siracha or other Chili sauce or oil available for the adventurous dinner.